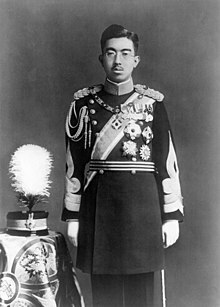 Hirohito[a] (裕仁, 29 April 1901 – 7 January 1989) was the 124th Emperor of Japan according to the traditional order of succession, reigning from 25 December 1926, until his death on 7 January 1989. He was succeeded by his eldest son, Akihito. 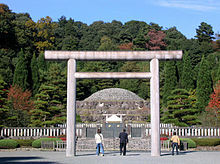 In Japan, reigning emperors are known simply as "the Emperor" and he is now referred to primarily by his posthumous name, Emperor Shōwa (昭和天皇). Hirohito was the emperor of Japan during the Second Sino-Japanese War which became World War 2 (1931 to 1945). Though he was supposed to be an absolute monarch (an emperor who can make all the laws and rules), most of the power in the Japanese Government during this time was held by Japan's Prime Minister Hideki Tōjō and the military. His role in WW2 is controversial. The state funeral for the late emperor was an international event. World leaders attending the funeral included U.S. President George H. W. Bush, French President François Mitterrand, and the Duke of Edinburgh. ↑ "Hirohito". Collins English Dictionary. ↑ 2.0 2.1 Imperial Household Agency (Kunaichō), 昭和天皇 (124); retrieved 2011-10-16. ↑ 6.0 6.1 6.2 6.3 Nussbaum, "Hirohito" at p. 318. ↑ "Britain wanted limited restoration of royal family's honors," Japan Policy & Politics. January 7, 2002. ↑ Corner, E. J. H. (1990). "His Majesty Emperor Hirohito of Japan, K. G. 29 April 1901-7 January 1989". Biographical Memoirs of Fellows of the Royal Society, Vol. 36, pp. 242–226; retrieved 2011-10-16. This page was last changed on 1 April 2019, at 12:41.